Sorry to report concerning my last experience with Fair Isle Ford was not as pleasant as others have reported.I have a 2011 Ford F150 .After I bought the truck,maybe a year or so after,I complained about lowering in oil by as much as a litre and a half between oil changes. I was told excuses such as ,I was not checking the oil right,that was normal to lower oil and that they dont always fill them up after an oil change??????? Finally after a visit on the first week of October I was told that they would do something for me.I was then told to bring it in on October 11th.I checked in on that Friday and was told that nothing had been done yet as they were waiting to hear from Ford Canada as to what test had to be done??? The next week I was told that I would be getting a new motor??? The next week I was told that they had to take out two pistons and check them out,then later told yes I would be getting a new motor,and that could take as long as three weeks.On Nov.10th I called and was told that the motor could be their on that day so I asked how long that would take and was told that the person who did that was out on sick leave,(only one person could do that I guess).I told them that I would be out of province for a week beginning on Nov.15 so I was told to keep the rental till I returned.The day after I left I got a phone call message saying that I had an appointment for my truck,why ,they have the truck their!!! 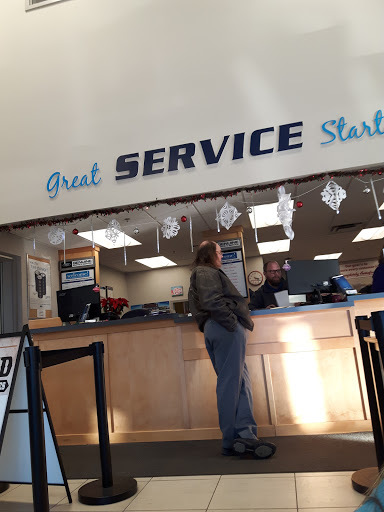 On the 23rd I got a call that my truck was ready(,I am still not home) Messages were not being passed on in the service department.Finally I picked up my truck on Nov.24th after it being in their from Oct11th. It seems to be working fine but I have not checked the oil YET??? Fair isle Ford has capable friendly staff so I rate them nearly 5/5. Ford Focus quality has not improved enough for me to stay as a Fair Isle Ford customer. I have 100,000 km on a 2005 Focus and although I have done everything possible to maintain it properly, ie. regular service and maintainance at Fair Isle Ford and annual rust prevention at Shine Depot, The power steering is leaking; the air conditioning has been leaking for several years; the rocker panel has a rust hole in it. All of these are expenisve repairs, probably 3 to 5 thousand dollars, and how much is the car worth? I thought Ford quality was improving but they are just not catching up with their competition Maybe the Ford Motor Company gets a 2/5 rating. Thus, I will probably be saying goodbye to them and Fair Isle Ford during the next year. You probably will not post this and I am sorry to write it but I am just giving my opinion. Good luck! Had spent a lot of time researching for a new vehicle. Had 2 cars in the running and visited with Jason Doucette a couple of times over 6mos. We had previously owned a Ford escape 2007 and then a Ford fusion. We loved both vehicles. We purchased a beautiful 2017 Ford escape with everything we wanted. Thanks for the excellent Jason and all the team at fair isle ford. I have been a customer of Fair Isle Ford since moving to Charlottetown in 2005. I can honestly say that the staff do provide service that is second to none when it comes to both sales and service. They truly have the best interests of the client at heart. I would highly recommend them to anyone seeking a great experience with their new or used vehicle needs. I have been a customer at Fair Isle Ford since moving to PEI in 1987. Never a bad experience. Staff are friendly and knowledgable and go above and beyond to provide service to their customers. My most recent experience, the purchase of an F150, has been no different. Sales staff were fantastic and worked very hard to satisfy my needs. Use their service bays for my Econoline camper van. One of only a few places in Charlottetown with a heavy truck lift. So I get Ford parts along with friendly and knowledgeable service staff. Free wireless in the showroom waiting room is also a bonus. My only regret is forgetting to call me to say "your car is ready"
The experience was positive from start to finish. I first met Jason Doucette early on when I was researching different SUVs, with no intention to buy or lease anything till the summer. Jason was / is very easy to talk to and never once did I feel pressured. Service was on time. I was phoned and told what the problem and cost would be and if they were to go ahead. Therefore there was no shock when I picked up my truck. I was dropped off and picked up by their shuttle service. Driver was kind and curtious. Squeezed me in for an oil change. The gentlemen in service was very attentive and made me feel like a priority. They did some other maintenance on the SUV and still got me out of there in around an hour. I love my Ford and love this dealership! I have been a client of Fair Isle Ford Sales for apx. 3 yrs. Although I did not purchase my vehicle through this company, they have been very kind in every aspect. I highly recommend this company for its service! They got my truck in and out, under an HR for inspection as I was informed it would. Coffee and muffins are a nice touch,could use a stronger coffee other than breakfast blend, but good all the same. My last visit was a very positive one. The staff could not do enough for me and were pleasant to deal with. Not all of my problems were resolved but we are working towards getting them finalized.